Objective: Iliopsoas injury and strain is a commonly diagnosed disease process, especially amongst working and sporting canines. There has been very little published literature regarding iliopsoas injuries and there is no information regarding the ultrasound evaluation of abnormal iliopsoas muscles. This manuscript is intended to describe the ultrasound findings in 73 canine agility athletes who had physical examination findings consistent with iliopsoas discomfort. The population was chosen given the high incidence of these animals for the development of iliopsoas injury; likely due to repetitive stress. Methods: Medical records of 73 agility performance canines that underwent musculoskeletal ultrasound evaluation of bilateral iliopsoas muscle groups were retrospectively reviewed. Data included signalment, previous radiographic findings, and ultrasound findings. A 3-tier grading scheme for acute strains was used while the practitioner also evaluated for evidence of chronic injury and bursitis. Results: The majority of pathologies were localised to the tendon of insertion, with the majority being low grade I-II strains (80.8%). Tendon fibre disruption (71.2%) and indistinct hypoechoic lesions (91.8%) were the most common of acute changes noted. Hyperechoic chronic changes were noted in 84.9 percent of cases. Acute and chronic changes were commonly seen together (62.8%). Conclusion: Diagnostic musculoskeletal ultrasound was used to identify lesions of the iliopsoas tendon consistent with acute and chronic injury, as well as identifying the region of pathology. The majority of agility performance dogs had low grade acute strains based on the tiered system, with mixed acute and chronic lesions being noted frequently. Application: Diagnostic musculoskeletal ultrasound provides a non-invasive diagnostic modality for patients suspected of having an iliopsoas strain. Breur, G.J. Blevins, W.E. (1997) Traumatic injury of the iliopsoas muscle in three dogs. Journal of the American Veterinary Medical Association, (210), pp. 1631-1634. 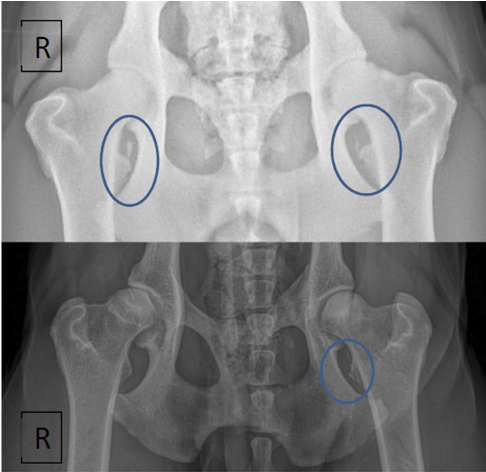 Cabon, Q. Bolliger, C. (2013) Iliopsoas muscle injury in dogs. Compendium on Continuing Education for the Practising Veterinarian, 35:E2. Canapp, S.O. (2007) Non-responsive hind-limb lameness in agility dogs: Iliopsoas strains. Clean Run; 2-5. Anderson, K. Strickland, S.M. Warren, R. (2001) Hip and Groin Injuries in Athletes. The American Journal of Sports Medicine, (29), pp. 521-533. Carmichael, S. Marshall, W. (2012) Muscle and tendon disorders. In: Tobias KM, Johnston SA, eds. Veterinary Surgery: Small Animal. St. Louis, MO: Elsevier. 1127-1134. Morelli, V. Smith, V. (2015) Groin Injuries in Athletes. American Family Physician, 64(8), pp. 1405-1414. Ooi, C.C. et al. (2014) Applications and limitations of axial-strain sonoelastography and shear-wave elastography in the assessment of tendon injuries. Skeletal Radiology (43), pp. 1-12. Montgomery, R. Fitch, R. (2002) Muscle and tendon disorders. In: Slatter (ed): Textbook of Small Animal Surgery. 3rd Saunders, 2264-2271. Da Silva, C.G. et el. (2009) Fibrotic myopathy of the iliopsoas muscle in a dog. Veterinary and Comparative Orthopaedics and Traumatology, (22), pp. 238-242. Anderson, K. Strickland, SM. Warren, R. (2001) Hip and Groin Injuries in Athletes. The American Journal of Sports Medicine (29), 521-533. Baltzer, W. (2012) Sporting dog injuries. Veterinary Medicine dvm360.com; 166-177. Nielson, C. Pluhar, G.E. (2005) Diagnosis and treatment of hind limb muscle strain injuries in 22 dogs. Veterinary and Comparative Orthopaedics and Traumatology, (18), 247-253. Holsebeeck, M.T. (2001) Sonography of bursae. Musculoskeletal ultrasound (2), 131-170.